Should Basketball Players Be Evaluated Behind A Screen? When people try to compare players across eras in the NBA, they inevitably run up against the reality that the game has changed in fundamental ways. At the most basic level, teams shoot a lot less — but at a better percentage than they did in the 1960s. In 1961-62, Wilt Chamberlain famously averaged 50 points and 25 rebounds for an entire season, but in a league that averaged 8619 field goal attempts per team. Last season, the league averaged 6660 FGA per team — about 23% fewer shot attempts. In 61-62, the league shot 42.9% from the floor. In 10-11, the league shot 45.9%. That means an extra 600+ missed shots available for rebound in Wilt’s era. Another 600+ assist opportunities (although assists were awarded less liberally back then). So, do we just give up? Do we trot out the old, “You just can’t compare eras…” trope? Inspired by a question from my son, I dusted off my era translator spreadsheet and took a look at Oscar Robertson and Lebron James. My method is simple (at least I think so). It looks at a player’s share of his own team’s production and then applies that share to a hypothetical team’s production — in a different era. I swear it’s simpler than it sounds. 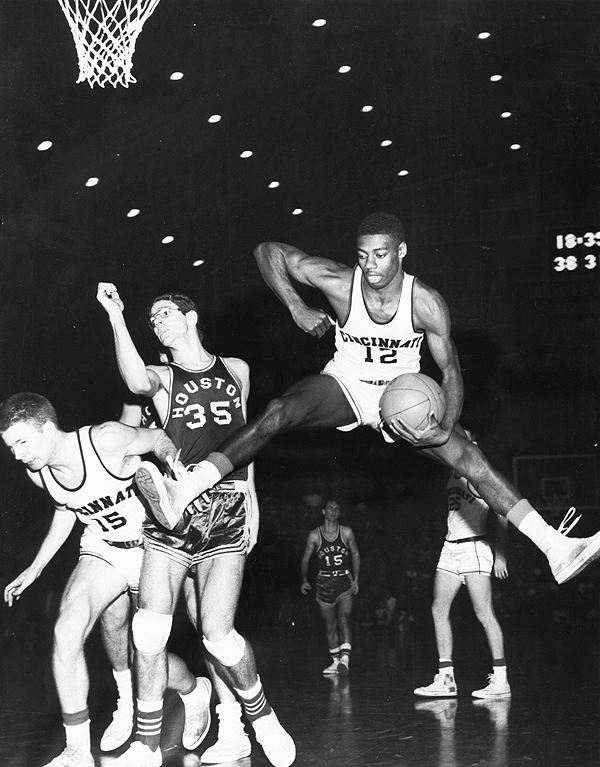 Let’s take Oscar Robertson’s monster 1961-62 season. This is the year the Big O averaged a triple-double for the year — 30.8 points, 12.5 rebounds and 11.4 assists per game. Another way of looking at those numbers is to say that Robertson scored 25% of his team’s points, grabbed 17% of his team’s rebounds, and dealt 42% of his team’s assists. Apply those percentages to the average team in the 2011-12 NBA, and we get per game averages of 24.0 points, 7.5 rebounds and 8.7 assists. Not a triple-double, but still a monster player — a Lebron James-esque figure in today’s NBA. So, what happens if we go the other direction and translate Lebron’s stats to Oscar Robertson’s team in 1961-62? This year for Miami, Lebron has scored 26% of the points, grabbed 18% of the rebounds, and delivered 31% of the assists. Translation: 32.7 points, 13.3 rebounds and 8.7 assists in Oscar’s era. And there you have it — players compared across eras. Not by comparing skills or imagining what Lebron would be like if he was transported via time machine back to 1961, or what Robertson would be like if he’d been born in 1984 like Lebron. Instead, look at each player’s relative contributions to his own team and compare their relative dominance over the players of each player’s own era. Those impacts can be compared. And in that comparison we can see that Lebron has an Oscar-like impact on today’s game. Kinda cool if you ask me.